Stanley generously shared his recipe and I tried to make them the moment I got pack to Brooklyn. I used the last of the persimmons I could still find and the White Lilly flour I’d been hoarding since my last trip down south. I was onto a new deadline so I rushed through, cut corners, and they just didn’t come out the way I remembered. I was going to try again but by then the persimmons were long gone. When they did finally reappear, I bought them early then waited for them to ripen. I picked up my favorite leaf lard for baking and made the jam. I woke up early to make them one morning when I realized that what was left of the White Lilly flour was well past the expiration date. I knew I’d be home to Florida in a few short weeks where they sell it but then I wouldn’t have the persimmon jam. Normally, I think there’s something great about a product that sticks to its regional roots – until it gets in my way and then I just want what I want. I couldn’t figure out a way to get the persimmon jam and the White Lilly flour in the same state and at the same time. Desperate for a solution, I did a few quick searches and came across an alternative for DIY self-rising flour. At this point true southerners and biscuit purists might want to look away, but it worked. Taking my time to follow Stanley’s directions, they fried up nicely. I think I was stingy with the lard before but didn’t make that mistake again. Now that I’m home to Florida for a few weeks, I plan on picking up some White Lilly – both to use while I’m here and take back to Brooklyn. I might make them again on Christmas morning but swap out the persimmons for red guavas. I loved the persimmons but red guava jam would go perfectly with the dough and you can only find them here after all. Recipe by Stanley Dry who noted: Fried pies can be made with either pie dough or biscuit dough. Each has its adherents. Pies made with pie dough have greater keeping qualities, while those made with biscuit dough are more tender; like biscuits, they should be eaten in short order. This recipe uses biscuit dough, but shelf life is not a problem, since the pies tend to disappear almost as soon as they come out of the skillet. Use a low-gluten flour, such as White Lily, and either a combination of butter and lard or clarified butter for frying. Combine self-rising flour and sugar in a mixing bowl. Cut butter into small pieces and add to bowl, along with lard. Using a pastry cutter or two knives, cut butter and lard into flour until mixture resembles coarse cornmeal. Add milk and combine quickly with a rubber spatula. Sprinkle counter with a generous amount of all- purpose flour. Turn dough out onto floured surface and knead a few times with floured hands. Dough should be a little stiffer than for biscuits. 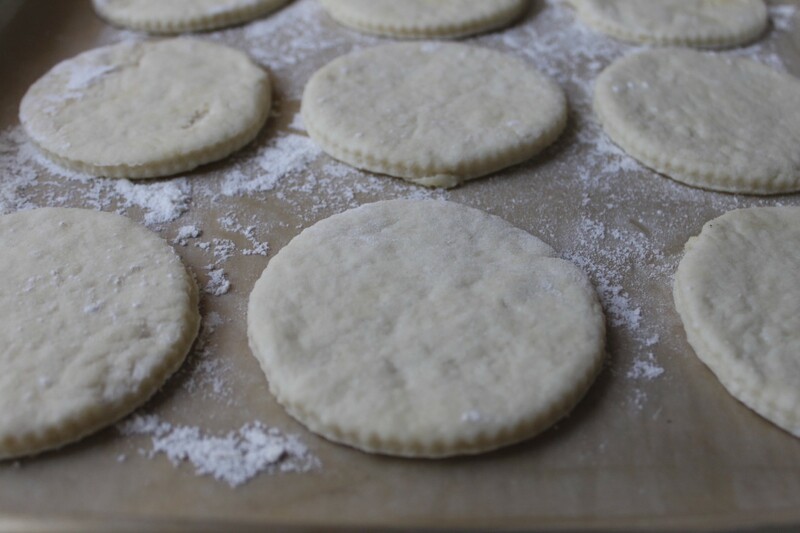 Roll dough out to a thickness of 1/4-inch, sprinkling dough with additional flour, as needed, to prevent sticking. 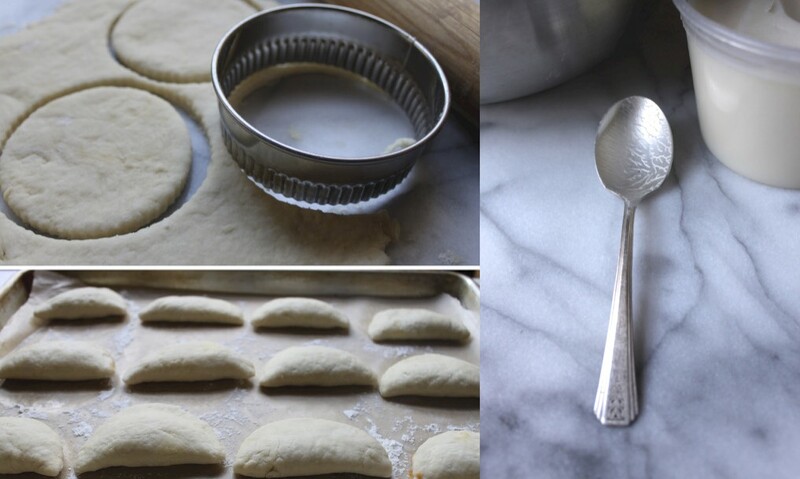 Using a floured 4-inch biscuit cutter, glass, or can, cut rounds of dough. Piece together remaining dough, roll out and cut more rounds. You should have 12 4-inch rounds of dough. To assemble: Line a sheet pan or cookie sheet with wax paper and sprinkle with all-purpose flour. 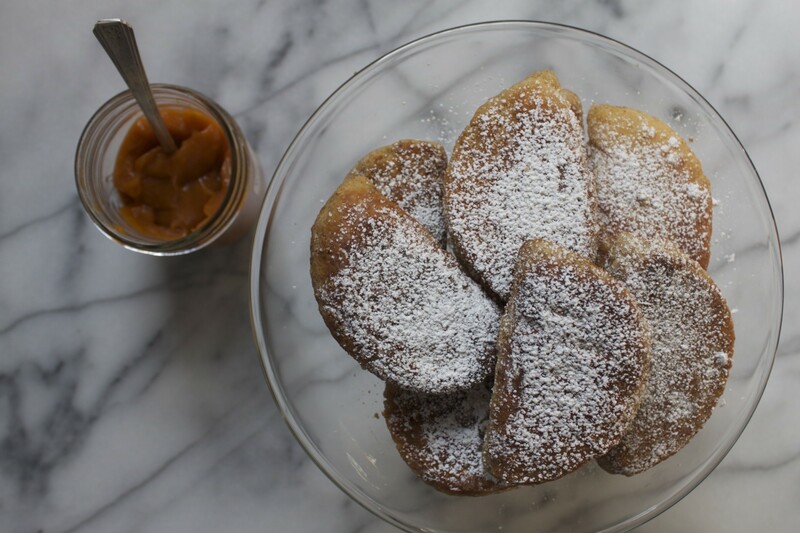 Using a spoon (an iced-tea spoon is best), place a small mound of persimmon jam in the center of a round of dough. Moisten the bottom edge of dough with water, fold dough over to make a half-moon shape, and crimp to seal with your fingers. Transfer to floured wax paper. Repeat with remaining rounds of dough. To cook: Add equal amounts of butter and lard (or clarified butter) to a depth of about 1/4-inch in a skillet and heat. When fat is sizzling, slide pies into skillet, being careful not to overcrowd. Fry on one side until browned, turn with a spatula, and brown the other side. Transfer to a tray lined with paper towels to drain. Repeat, adding more butter and lard as needed, until all the pies are cooked. Arrange pies on a platter and sprinkle with powdered sugar. Makes 12 pies. This recipe makes a very stiff jam to use as a filling for fried pies. If you want a softer jam to spread on biscuits or toast, use less pectin. Since the mixture isn’t cooked, this jam needs to be refrigerated or frozen. 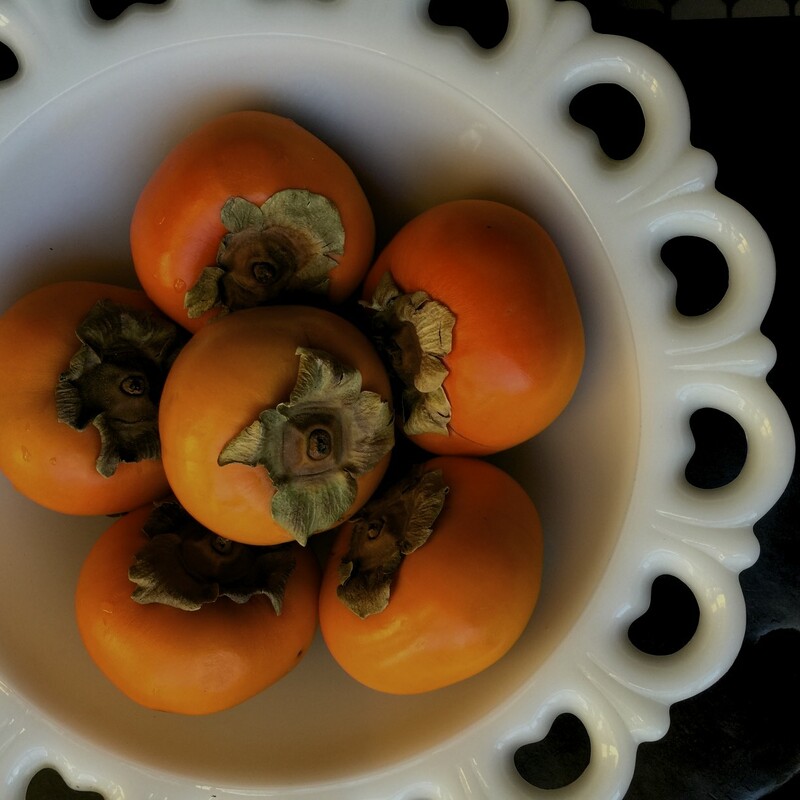 Place persimmon pulp in blender. In a small bowl, stir pectin and sugar to combine. Add pectin and sugar to blender and process on high until thoroughly mixed. Fill clean container(s) with jam. Cover and refrigerate for immediate use or freeze. Makes about 1 pint. ← The Cuban Table is here! my fav from all fruits, persimmon. me encanta. lovely! Oh my gosh. These are so lovely! Oh my! This just looks delicious. I must try to make something of the like. I only just tried persimmons for the first time a few weeks ago. It’s a delicious fruit. I bet that yam must be even better. Thanks for sharing this recipe. These look fantastic! 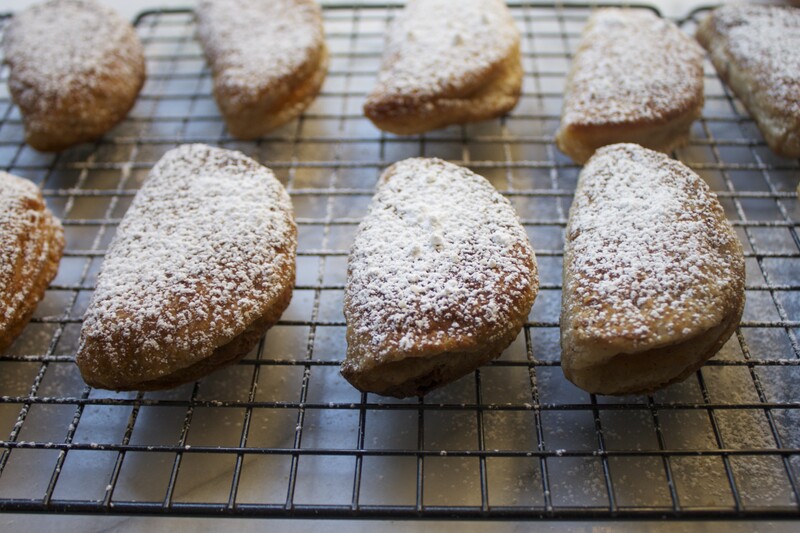 I had my first fried pies in Mississippi a few years back and I can still remember every flaky bit. Will try this one for sure! What a great way to use persimmon this season! I love hand pies! Thanks for sharing this recipe. My family raised persimmons when I was growing up and they are my husband’s favorite fruit, so I was up before dawn making him a batch for Christmas morning! There will be more, since we found a tree loaded with fruit at an abandoned homestead this afternoon and came home with 20 pounds. 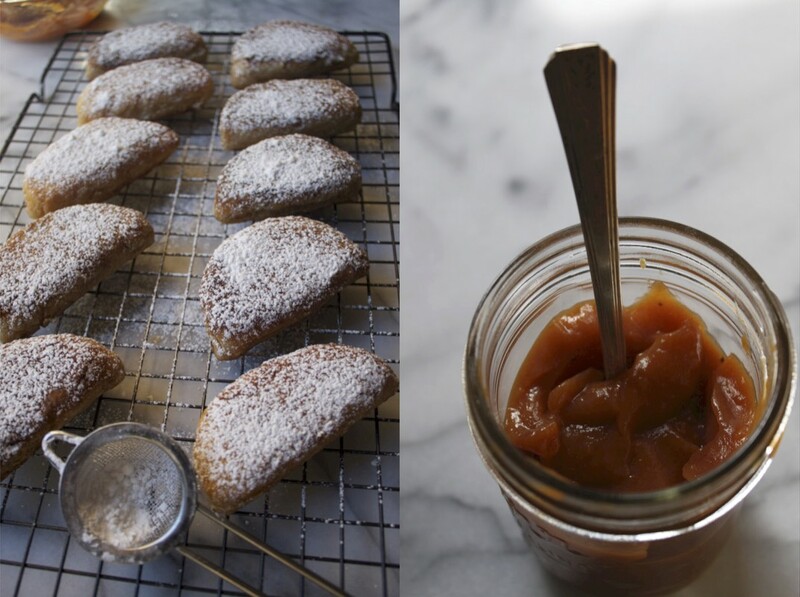 I love the persimmon jam, put a little cinnamon into mine when I made these. Thanks for the recipe!